Who needs Word? For many situations, opening up Microsoft Word and creating a document can be like wielding a sledgehammer to crack a walnut. Word seems to get more and more complicated with every iteration of Microsoft Office. I’ve delivered a lot of computer training over the years to people who just feel overwhelmed by the quantity and complexity of the choices they have to make when using it. Apart from the time it takes to open the program, we often just need don’t need any of the fancy formatting, fonts or other complications that Word introduces. And it may be that we’ll only need the information for a short time, so we may not even want to bother thinking of a name, saving the file, etcetera. Notepad is like a word processor (such as Word), but it doesn’t have any formatting capabilities. The resulting data file is known as a “text file” (with a file extension of “.txt”). Simple word processors that deal with pure text files are usually known as “text editors”. The fact that the data file is nothing but pure text has the great advantage that it can be read by any other text editor. There will be no compatibility problems when reading text files created or edited by different text editors as the files they read and create have nothing but text in them (so there are no complicating factors of invisible commands embedded in the text or anything like that). Also, Notepad is very quick to open and close. One thing to remember, though, is that by default the text will appear on one great line of text that scrolls sideways as you add to it. This can be changed by clicking on the “Format” command and then clicking on “Word Wrap”. This wraps the text onto the next line automatically as you would expect. Wordpad is also like a simplified word processor, but it does have some formatting capability, such as fonts, inserting objects (eg pictures), and text justification (aligning text left, right, or centre). If you find Word irritatingly complicated and sometimes think you can’t see the wood for the trees when using it, then do give Wordpad a try. Sticky Notes is a computer representation of the physical bits of paper that some people feel compelled to spread around their desk, computer, and anywhere else with a smooth surface. Using Sticky Notes, the notes appear on the computer desktop. If they disappear behind another program that is currently to the fore on the computer’s desktop they can be brought to the “top” by clicking on the Sticky Notes icon in the task bar at the bottom of the screen. The one thing I don’t like about Sticky Notes is that the text comes out in one of these “pretend handwriting” fonts that I find hard to read. There isn’t any simple way of changing the font, but what I do is to start off a note by pasting a piece of text from elsewhere into a new sticky note. The font of the pasted text is retained on that sticky note until it is deleted, so I keep re-using the same sticky note. 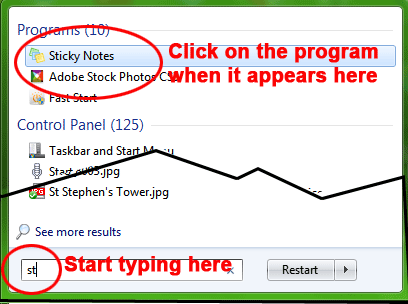 You don’t save the individual notes, but Windows will retain the current batch of sticky notes and re-present them if the computer is re-booted and the applet started again. You can also copy the text of a sticky note to paste elsewhere if you decide that it’s worth saving as an individual file. As with all programs running under Windows 7, there are several ways to launch these applets. The easiest way is to click on the “Start” button, type in the first few characters of the applet name, and then click on the applet name when it appears in the menu above the search box – eg for Sticky Notes, just type “st” (without the quotes) and then click on “Sticky Notes” above. When we think of creating and saving text, most of my computer clients will automatically use Word. Over the years, I have found that I use it less and less. I think this is partly because emails have replaced letter-writing and partly because there often better ways to store text information in our computer systems. All of the applets mentioned here are easy to use and get to grips with. Go on, give them a try.